At the invitation of the government of the Republic of Rwanda, Liu Xiaofeng, Vice Chairman of the National Committee of the Chinese People's Political Consultative Conference (CPPCC), will attend the inauguration ceremony of President Paul Kagame in Kigali on August 18 as the special envoy of President Xi Jinping. At present, the China-Indonesia relations enjoy sound momentum of development. China has grown into Indonesia's third largest source of investment and the largest source of tourists. The Jakarta-Bandung high-speed railway, the integrated industrial park and other major projects have witnessed steady progress. In May, during their meeting on the sidelines of the Belt and Road Forum for International Cooperation, President Xi Jinping and President Joko Widodo reached new important consensus on strengthening strategic alignment and cooperation on the Belt and Road Initiative. The China-Indonesia dialogue mechanism at deputy prime minister level and the China-Indonesia high-level economic dialogue are the high-level mechanism for the two countries'cooperation in the fields of security and economy, and it is the first time that these two meetings of cooperation mechanism are held back to back. During the meetings, under the theme of implementing the consensus of the two heads of state and with the deepening of strategic synergy as the main line, the two sides will extensively exchange indepth views on bilateral relations, political security, economic cooperation and other international and regional issues of mutual concern. We believe the meetings will further enhance the mutual political trust between the two countries, deepen practical cooperation and promote the development of China-Indonesia comprehensive strategic partnership. Q: According to media reports, UN Secretary-General Antonio Guterres said that the UN Security Council Resolution 2371 not only specifies the obligation for the DPRK to fulfill, but also represents an opportunity for diplomatic engagement and renewed dialogue to solve this crisis. The solution to this crisis must be political, and he is willing to facilitate the peace talks among countries. German Chancellor Angela Merkel echoed that viewpoint by saying that there is no military solution for this conflict, it must be worked out via negotiations. The US Chairman of Joint Chiefs of Staff General Joseph Dunford said that to realize the denuclearization of the Korean Peninsula through peaceful means is the common goal of China and the US. How do you respond to these remarks? A: We have noted that recently an increasing number of state leaders, including the US officials, have explicitly said that parties shall strive for the peaceful settlement of the Korean Peninsula nuclear issue through political and diplomatic means. As the Chinese side has stressed all along, the Korean Peninsula issue is deep-seated and complex, and its core and essence are security issue. Only by properly addressing the reasonable security concerns of various parties through dialogue can we achieve the final settlement of the Korean Peninsula issue and the denuclearization and long-term peace and stability on the Korean Peninsula. We fully agree with what Secretary-General Antonio Guterres has said, and hope that various parties can fully follow up on the UN Security Council Resolution 2371 in its entirety. While keeping on taking measures to curb DPRK's nuclear and missile programs, parties need to undertake their due responsibilities respectively and work harder to promote an early resumption of talks. The "suspension for suspension"proposal is the most reasonable, fair and viable proposal, and we hope parties can take it seriously and give positive consideration to it. Q: The US Department of State Spokesperson made remarks on the double-freeze proposal yesterday that there is no equivalency between the DPRK's nuclear and missile programs and the joint military exercises by the US and South Korea. Those joint military exercises have taken place for a very long time and are legal activities, and the US will continue to carry out those military exercises. How do you respond to that? A: As I said just now, you may have noted that an increasing number of countries, including the US, have explicitly said that parties shall strive for the peaceful settlement of the Korean Peninsula nuclear issue through political and diplomatic means. Recently, the high tensions on the Korean Peninsula have shown signs of abating, but the situation remains highly complex and sensitive. Various parties, including the DPRK and the US, who are the directly concerned parties in particular, should make more efforts to this end. As we said multiple times, the core and essence of the Korean Peninsula issue are security issue. Only by addressing the reasonable security concerns of various parties can we truly open the door to a peaceful solution to the Korean Peninsula issue. At present, the most pressing thing is to stop the DPRK's nuclear and missile programs and the vicious circle of escalating tension on the Korean Peninsula. To achieve this, it is worthwhile to put aside the contention over who should take the first step. Rather, we should focus our attention and energy on efforts for an early resumption of talks. We think that the "suspension for suspension"proposal is the most feasible and reasonable proposal under the current circumstances. It will not only ease the current tension but also address the most pressing security concerns of various parties, so as to create opportunities and conditions for the resumption of talks and find a breakthrough for the way out of stalemate. Indeed, if the US or other parties have better and more effective proposals, we will remain positive and open to them as long as they are conducive to the peaceful settlement of the Korean Peninsula nuclear issue and the early resumption of talks. Q: According to reports, Steve Bannon, the White House chief political strategistgave an interview to media last night, in which he said China and US were engaged in an "economic war"from which there could be only one winner. He said that the United States needed to get a lot tougher on bilateral trade and investment issues. Do you have any response to his comments? A: I just saw the relevant reports, but has yet to verify whether they are true or not. I would like to stress that, just as the Chinese side stated many times, the economic relations and trade between China and the US are mutually beneficial in essence. In fact, the long-term economic and trade cooperation between the China and the US have brought tangible benefits to the two peoples, which is an undeniable fact in the eyes of any unbiased person. A trade war does not serve the interests of any party, as fighting a trade war will not produce a winner. We hope that the relevant persons can stop perceive an issue of the 21 century with the zero-sum mentality of the 19th or 20th century. I want to add that the importance of the China-US relations is evident enough. The Chinese and US leaders and people from various sectors are willing to uphold the steady and sound development of the China-US relations in a more proactive way. The two sides need to strengthen dialogue and communication, promote across-the-board exchange and cooperation, properly handle each other's concerns and jointly ensure the steady and sound development of the China-US relations. Only by doing this can we best serve the interests of the two peoples. Q: A French baker Laurent Fortin was detained in Shanghai a couple of months ago. The family is calling for his release. Can you please provide any details on his status? A: I am not aware of what you said. 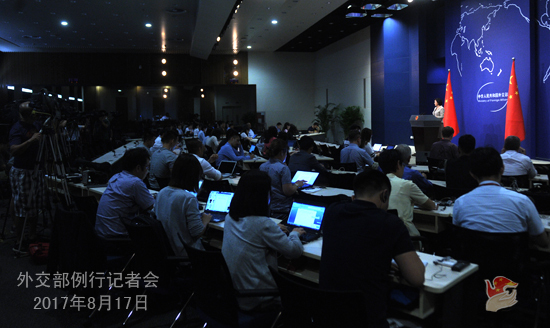 The Chinese judicial authority will handle the case in an impartial manner and protect the legal rights of the person concerned in accordance with the law. Q: A Chinese fishing boat was detained in Ecuador on suspicion of illegally catching rare sharks. Do you have any comment on this case? A: We have noted the relevant reports and are verifying the information. I shall stress that in terms of the protection of the endangered species of wild fauna and flora, the Chinese government's stance has been consistent. We adopt a zero-tolerance attitude towards the illegal trade in the endangered species of wild fauna and flora and their products. Q: The commanders of the Chinese and Indian border troops held a dialogue following the stone-pelting which led to slight injuries at Ladakh yesterday. Can you give us more details? A: The Chinese border troops have been patrolling in the Chinese side of the Line of Actual Control. The Chinese side urges the Indian side to abide by the relevant agreements and treaties between the two sides, faithfully follow the 1959 LAC and safeguard peace and stability in the border areas of the two countries. I am not aware of the ongoing engagement or dialogue between the border troops of the two sides on the ground. You may refer to the Ministry of National Defense if you are interested in that. Q: The US Chairman of Joint Chiefs of Staff Joseph Dunford said China should step up pressure on North Korea. Does China have any comment on this? A: You are all closely following the Korean Peninsula nuclear issue, and we have stated China's stance on multiple occasions. China has always, proceedingfrom safeguarding international non-proliferation regime, peace and stability on the Peninsula and China's security interests, formulate the relevant policy and take corresponding measures in an objective and fair manner and based on the merits of the matter itself. We have alwaysplayeda positive and constructive role on the Korean Peninsula nuclear issue. 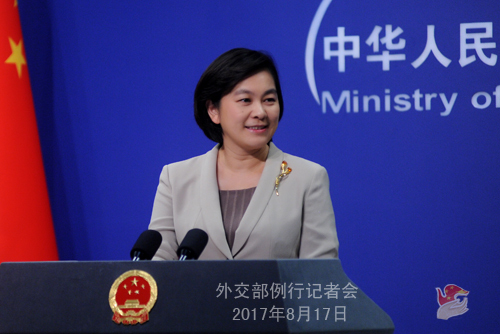 China's policy on the Korean Peninsula nuclear issue is consistent and will remain unchanged. Neither cajolery nor pressure works, still less threat. You may follow the press release of the meetings Joseph Dunford held with member of China's Central Military Commission (CMC) and Chief of the CMC Joint Staff DepartmentFang Fenghuiyesterday and with Vice Chairmanof the CMC Fan Changlong and State Councilor Yang Jiechi this morning. I just saw reports saying that Joseph Dunford stressed once again to peacefully achieve denuclearization ofthe Korean Peninsula is the common goal of both China and the US,and a military solution will be terrifying. On August 12, during his phone call with President Xi Jinping, President Donald Trump also said he fully appreciated China's role on the Korean Peninsula nuclear issue. 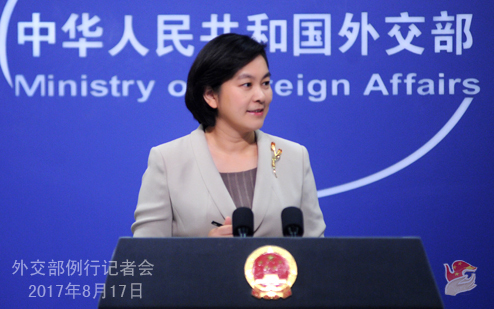 China is willing to keep communication with the US on the basis of mutual respect and jointly work for the proper resolution of the Korean Peninsula nuclear issue.